The Cosmopolitan of Las Vegas recently unveiled its new-look guestrooms, placing an added emphasis on modern design and luxurious comfort. However, the one-of-a-kind hotel may have already achieved perfection with its suites. Business travelers will especially love The Cosmopolitan’s Executive Suite, which is the perfect space for gathering with colleagues and entertaining friends or clients. In addition to a spacious living area, the suite features a six-seat conference table. 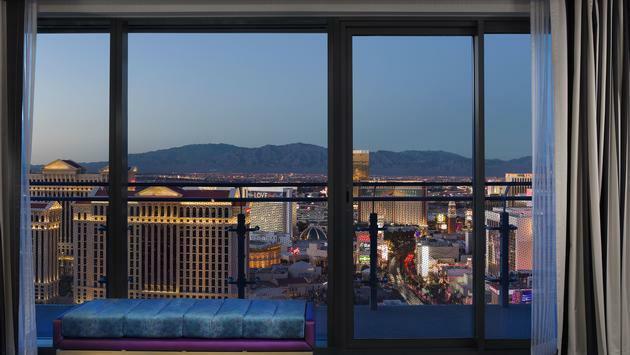 For panoramic views of the Las Vegas skyline, consider the Wraparound Terrace Suite. Highlights include the 480-square-foot private terrace as well as a sleek wet bar that comes complete with a Sub-Zero wine chiller. The suite is also available with gorgeous fountain views. Meanwhile, the Lanai Suite combines beach house chill with Las Vegas luxury, boasting floor-to-ceiling windows with pool views, an 800-square-foot private lanai with a hot tub and direct access to The Chelsea Pool in some cases. Guests traveling with large groups will likely be drawn to the Reception Suite, a 1,050-square-foot space with plenty of comfortable seating that can be reconfigured to your preference. The Cosmopolitan of Las Vegas also offers two bedroom suites for added privacy and comfort. Plus, your dog is welcome in any room. For travelers seeking a truly distinctive resort experience, the property’s Chelsea Penthouse is unsurpassed. Ranging from 2,400 to 3,700 square feet and two to three bedrooms, the suites offer floor-to-ceiling windows with panoramic views, separate wet bars and unique art collections. The Bungalow is guaranteed to be an equally memorable experience as it features three levels with a private terrace, jacuzzi plunge pool and round-the-clock personal butler service. Whether you’re traveling to Sin City for business or for fun, The Cosmopolitan of Las Vegas has ample options for a sweet suite stay.